Well, that I will definitely take. I have to admit, that being a Mom to two girls, owning a small business and working part-time out of the home keeps me busy. My beauty regimen isn’t as long as it used to be or as intricate as it used to be. When I find a product that works well and works quick, I’m more than happy to stick to it. I love the feeling of my legs after I use my epilator but, I sure don’t love the time I spend on it. Enter Schick Intuition Advanced Moisture. 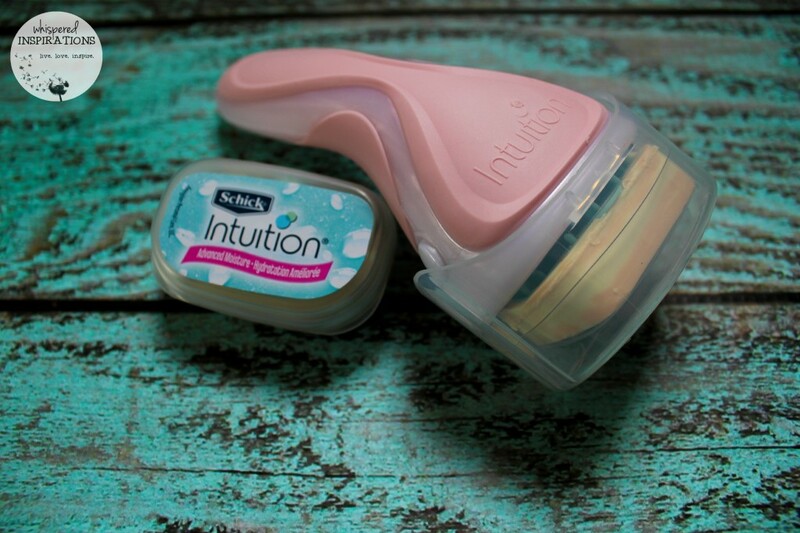 For the days that I can’t take the time out to epilate (which is almost everyday), I have used the Schick Intuition. Why? Well, simply because I can use it in the shower and literally just shave. That’s right, it requires absolutely no shaving creams as it has moisture and lather built right in. I’ve never been a fan of the messy shaving creams and found that quite often, it was easier for me to nick myself using them. It has an ergonomically designed handle, a pivoting head and four blades surrounded by a Skin Conditioning Solid containing Shea Butter to help achieve noticeably soft skin. The moisturizing skin conditioner doesn’t leave my skin dry after I shower and the Shea Butter smells absolutely divine. The four blades make for a close shave and the simplicity of just grab-and-go suits my lifestyle. I love that the Schick Intuition has a little “holster” that adheres to your shower walls. That way, you always have it nearby when you need it. I don’t know about you but, I’ve forgotten my razor A LOT in the past and I find myself yelling for my Hubs or quickly stepping out and getting water everywhere to grab my razor. I like how this keeps it dry when not in use and ready for when you need it next. The Schick Intuition Advanced Moisture has got you covered. After you’ve used the razor attachment that the Intuition came with, it comes with a replacement so you can keep the smoothness going. So, you can say good-bye to shave gel, soap or body wash forever – a perfect solution for the busy gal on the go. It retails for $11.99 and is available across Canada. I had a great experience with it and it leaves me with smooth legs. Best of all, I am able to use it in the shower and it helps with my go, go, go lifestyle! 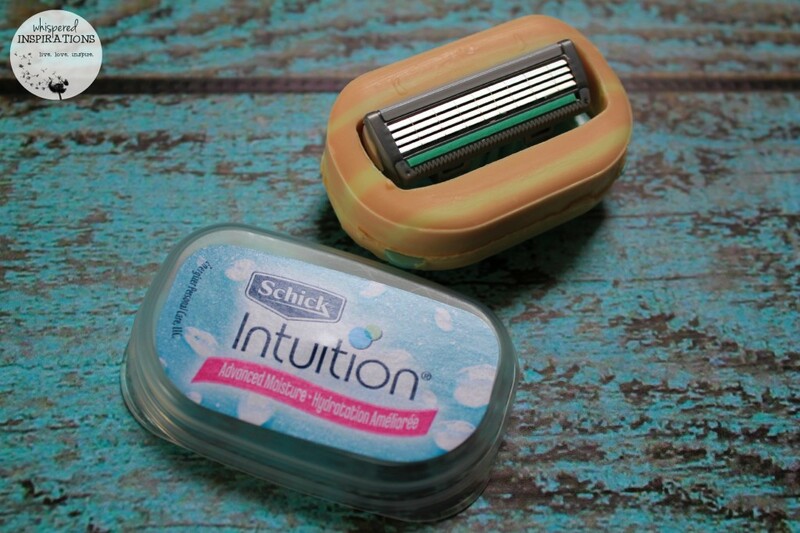 20 Lucky Whispered Inspirations readers will get a chance to try out the Schick Intuition Advanced Moisture razor. All you have to do is FILL OUT the short Rafflecopter form and you’re entered. Plus, there’s a BONUS! Out of the 20 winners, when you submit a short review of your experience to me, you’ll be entered to WIN a $100 Visa Gift Card! That’s a 1 out of 20 chance to WIN! Why do you want to try the Schick Intuition Advanced Moisture razor? Nothing better than a GOOD razor. 🙂 Would love to try this and complete a review. I am always up to for trying a new razor! I would also love to try a razor that doesn't require shaving cream! I used to use them and loved them, I'd love to try them again because they're super convenient! Would love to try…love the fact it moisturizes as you shave. And legs really need moisturizing in the summer! I love the fact that you don't have to use any shaving cream with it. The fact that it sticks to your shower wall is great too. That would save a lot of room in my shower. I want to see how well it works. I would like to try this because I love Schick razors and would like to try their newest one. I really want to see if it is as moisturizing as the say it is, my legs are always dry after shaving and with little ones always hanging off me and my long legs, I want smooth and moisturized legs! I would like to win because I'm always on the lookout for a new, quality razor. I have used Schick in the past, and find them to give a close shave. Would love to offer my thoughts on it as well. because my legs are so dry this would be great I also hate having to lather in the shower to shave. I would love to try the Schick Intuition because I am one of those women that has to shave her legs every day due to thick bristly hair. I would love to be able to save time and money by not having to buy shaving cream since it is built in. I like that it has Shea butter conditioning solids built around it. So would be able to just grab my Schick Intuition and shave and get going every morning. I would love to gift this to my daughter that has just started shaving. 🙂 All in one is easier and more convenient for tweens. I love razors that are all-in-one – quick and simple – that's my motto – would love to give this one a go! I'd love to give it a try for smooth summer legs! I'd like to tryi it cause I have sensitive skin which doesn't seem to like me using a regular cheap razor. I want to try the Schick Intuition Advance Moisture Razor because I love the idea of a built in moisturizer instead of having to apply that separately. I would like to try this because Schick Intuition is my favorite razor brand. I can't believe they could improve it any more! I want to try it because omg it’s July 8th and I’m already tired of the shaving routine! My legs could be shaved every day quite easily and I need quick!! I would like to try a new razor. Would love to try this out as I have never used a razor with a moisturizer. Love doing reviews so no problem with that. I am not happy with my current razor and would love to give this one a try. I always shave so constantly looking for new products and a way to be quicker! I'm always on the hunt for the perfect razor. It seems so easy to use and soft on the skin. I would love to win and try this out, looking to find something to replace my current razor and shaving cream routine. I would love to try this product because I'm always on the hunt for something to moisturize my skin and it would be great to save that time in the shower. I want to try it because I LOVE Intuition razors. They are my fave. Love that it moisturizes as you shave! My legs are so dry I think this razor would be ideal for me. Would love to try. I've seen these razors without cream, but I've never given it a try. Would love a chance to give up the can of shaving cream! I love all Schick's products they work great! I'd love to try this razor because it's pink, it can be hung on the shower wall and it's advanced moisture which would be great for silky smooth legs/arms. I want to try it to see how well it works, to see if I like it. love these…dont have to use shave cream or soap…just wet and go! A razor that doesn't need shaving cream would be super convenient for camping and travel! One less things to pack and worry about spilling in my luggage! Awesome – would love to try and review this! This razor looks awesome and I would LOVE to try it. I find I cut myself on the other type brands so this one looks much safer. I would love to try it cuz I love trying new products and voicing my opinion. Also, if I don't have it use shaving cream and moisturize as much it's a bonus. I'm always on the lookout for a superior shaving experience. This sounds so much quicker. I am in need of a new razor that works and moisturizes as I have sensitive skin. I would love to be able to try this. Thanks for the chance. Anything that means I have to shave less – I'm on board! My wife is always complaining about her razor, this would be good for her to try. I would like to try this because my skin is so sensitive and I think this would give my skin a much needed break. Good razors are hard to find…would love to try and review! I would love to try a new product that has skin moisture and a shower unit. This sounds like a revolutionary idea and love the fact it has the moisture so hard to shave dry, legs. This is a great product. My daughter will love this! My dry skin is terrible to shave – this would be great to try. Would be awesome to try this razor, and to not have to use shaving cream would be easier and less mess ! I love how I can just grab it and go! 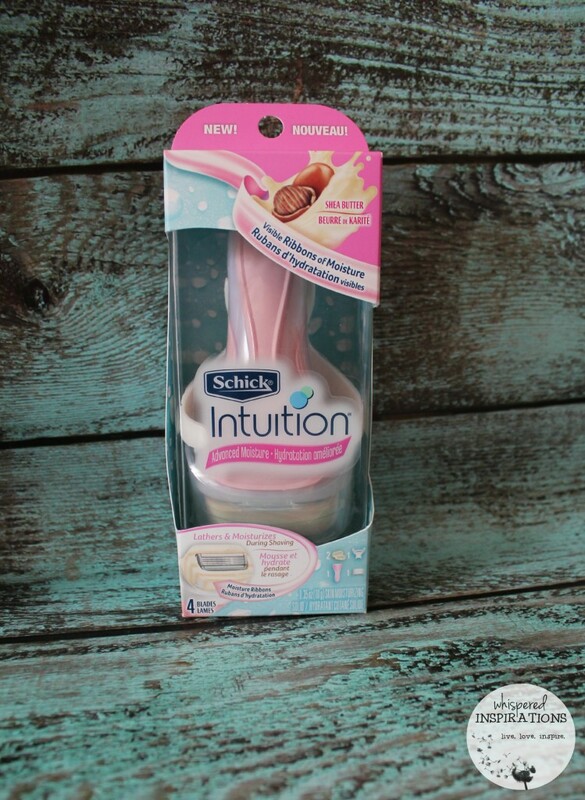 I use it when we go camping or stay over night somewhere.I don't have to worry about bringing shaving gel along.The Schick Intuition leaves my skin as soft and smooth as a rose petal.I love it! I always end up with razor burn, no matter what razor or shaving cream I use. I would love to give this one a try to see if it will not cause me to get razor burn! I would love to try a good quality shaver. I am still searching for my perfect razor….would love to try this!!! I would like to try this Schick as I love the idea of not having to use shaving cream. I have never tried anything like this before! I am getting so sick of using shaving cream! I have one that I have been using for more than 7 years. I need a new one please. I love my schick intuition razor. This is an incredible review! 🙂 Makes me want to try it! I want to see if my skin doesnt react to it! Yes please! 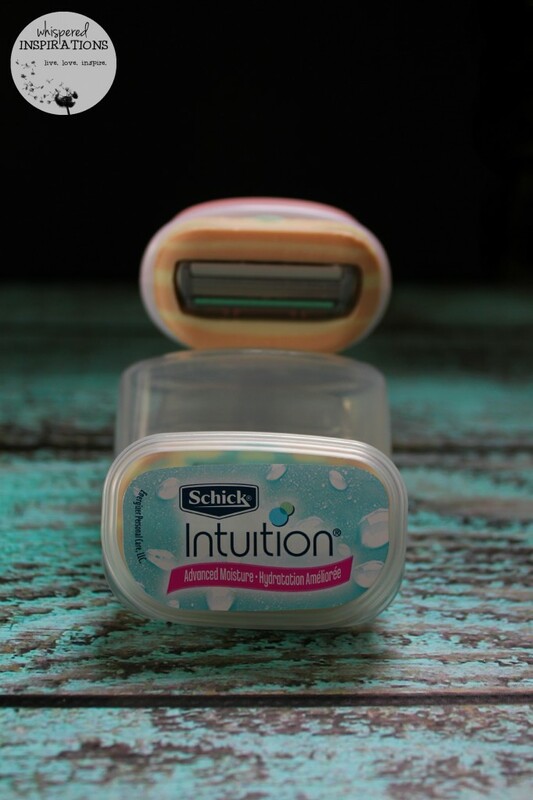 I love all Schick Intuition razors and I know I'll probably love this one as well. I have fair skin and dark hair. So I go through a lot of razors, especially in the Summer months. Looks like a great razor! I want to try it because I have never tried it before and would love the chance. I would love to try this schtick razor as i have sensitive skin and find razors can really irritate my skin at times! After reading this blog i 'm really excited to try this,so amazing no more need of shaving gel now! This would make shaving easy! would love a good razor! This razor seems really easy to use! to get smooth skin thanks to this great razor! I want to try the razor so my legs will be so smooth. I like how I dont have to use shave cream with this razor! I had tried these a long time ago and I liked them very much. But I started buying the really cheap razors to save money, and now I want to go back to the good ones. I would like it because I've never tried this particular razor before. 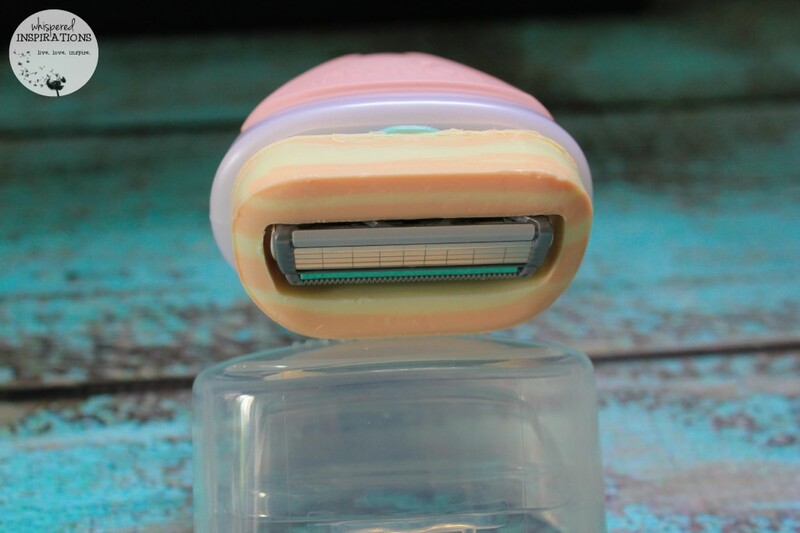 I want to try the Schick Intuition razor because it's summer so I'm shaving my legs more and I need something that soothes my skin and keeps it from drying out. I would like to try the Schick Intuition Advanced Moisture razor because I like that it lathers itself and I'm curious about the 'advanced moisture'! Sign of the times – always on the run trying to keep up to a 10 year old active bundle of energy. Time utilized spent smartly – eliminate two steps with just one – shave/moisture simultaneously – I would have to jump all over that perk. Schick is the only razor that I use – so an upgrade new product would be ultimately more advanced and quality speaks for itself. Because I have yet to find that perfect razor! I would love to try the Schick Intuition Advance Moisture Razor first of all to save money by not having to purchase extra gel or cream. I really like the fact that it is all in one as this way it will also save me time! I would love to try this razor,I can never seem to find one that I am completely satified with.I would love to write a review after trying this product. I need to find a good razor I cut myself everywhere!! Looks like a nice size and like you can hang it in the shower! I love that you dont need shave cream! 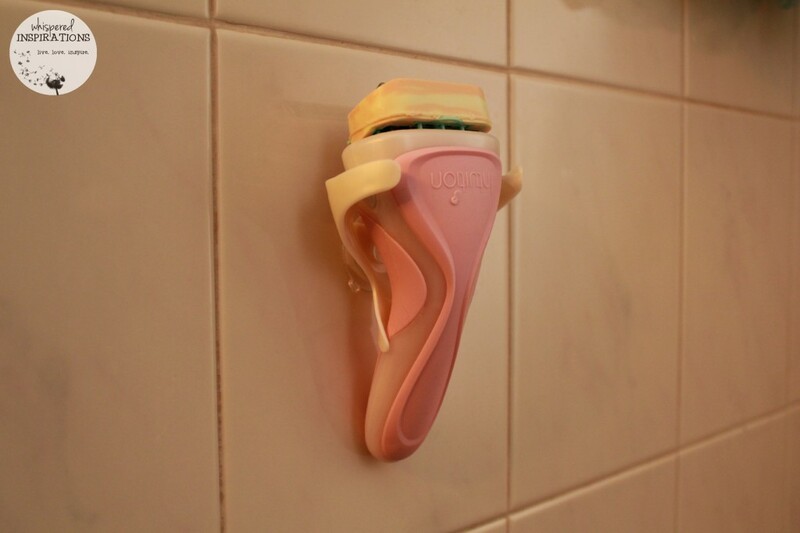 I like that you can attach it to the shower wall – which saves space and I also like that you don't have to use shaving cream. Seems like a great product with good results too! I'd love to try this razor to see how it compares to my current razor. I like the idea of the shave bars on this razor which would eliminate the need for a shave gel. how can you argue over a free razor?!? love the built in moisturizer idea. Great review. I'd love to try this razor!